Sautéed mushrooms and barbecue sauce make a quick and easy topping for a comfort food classic. 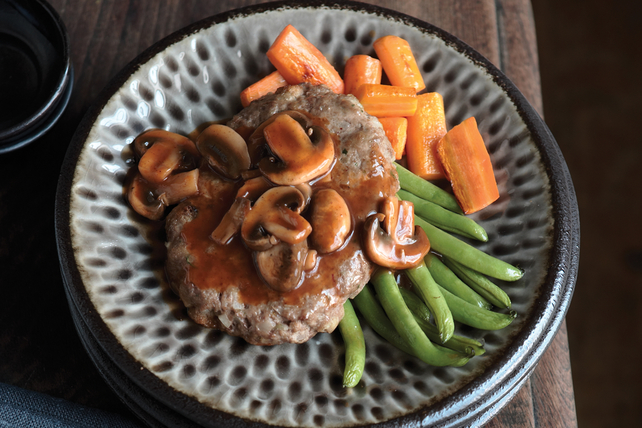 This Country Salisbury Steak recipe features moist ground beef patties and a savoury mushroom sauce - this recipe is a must-try! Mix meat, stuffing mix, 1 cup water and onions just until blended; shape into 6 (1/2-inch-thick) oval patties. Place on rimmed baking sheet. Bake 25 min. or until done (160°F). Meanwhile, cook mushrooms in large nonstick skillet on medium-high heat 5 min. or until tender, stirring occasionally. Stir in barbecue sauce and remaining water; simmer on low heat 1 to 2 min. or until heated through. Serve meat patties topped with sauce. Serve with hot cooked vegetables, such as carrots and snow peas.